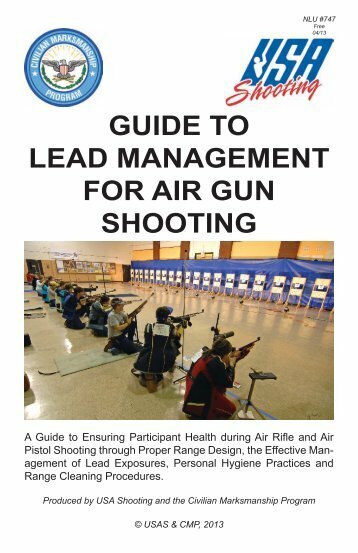 The Guide to Lead Management for Air Gun Shooting produced by the Civilian Marksmanship Program (CMP), 2013, is a misleading publication that may seriously jeopardize the health of millions of high school children and staff across the nation who may come into contact with lead particulate matter as a result of inadequate supervision and maintenance of indoor firing ranges. The CMP provides mandatory training and curriculum to Army, Marine Corps, Navy, and Air Force JROTC Marksmanship Instructors. The course covers how to safely and properly conduct air rifle live firing in the nation's high schools. This CMP publication is based on dated and questionable science. It minimizes the health risks associated with indoor firing ranges using air rifles and pistols. Technical aspects of the CMP guide rely on the findings of Health & Environmental Technology LLC (HET), an environmental testing firm from Colorado Springs, Colorado. The sole employee of HET is Mr. Robert Rodosevich. HET has come under scrutiny in Colorado for "gross technical incompetence in technical compliance." HET was contracted last year by a listing Realtor to prepare a "Preliminary Assessment" of the degree of contamination of a house used as methamphetamine lab. HET came very close to giving the house a clean bill of health before properly licensed professionals were called in to conduct a thorough and legal evaluation of the highly contaminated residence. A Colorado regulatory audit, resulting in findings of "noncompliance and regulatory misconduct" dated May 29, 2012, and performed by Forensics Applications Consulting Technologies found HET's work to be "fatally flawed". The audit reported, "The HET document was not prepared by an individual documented as being capable or authorized under regulation to perform such work. .The document prepared by HET exhibited gross technical incompetence in technical compliance.."
The state auditor continued, "Mr. Robert Rodosevich has violated state regulations by entirely failing to demonstrate that he has any kind of knowledge in performing the work at all." The auditor's report documented 35 violations of state regulations. "The issue of whether air gun firing creates airborne lead was re- examined in 2007 tests conducted by Health & Environmental Technology (HET), a professional environmental testing firm from Colorado Springs, Colorado. These tests were conducted on an air gun range at the U. S. Olympic Shooting Center. For these tests, air samplers were placed in the breathing space of the air gun shooters while they fired and next to the target backstops. No measurable airborne lead was detected by any of these monitors during air gun firing." Firing air rifles or air pistols at muzzle velocities prescribed for target shooting (<600 fps) does not generate any detectable air- borne lead. There is therefore no need for special ventilation systems on air gun ranges since there is no airborne lead to exhaust from the range. Normal ventilation achieved by modern HVAC systems provides more than adequate ventilation for air gun ranges." Rodosevich says the air is safe to breathe in hundreds of high schools across the country with indoor firing ranges. Amazingly, there's little to substantiate or repudiate this claim regarding the air, but no one disputes the health risks associated with the accumulated lead particulate matter on the floor at the muzzle of the firearm and on the floor around the target area. For instance, many jurisdictions across the country have discontinued the use of lead ammunition at indoor police firing ranges. The high cost of non-lead ammunition is typically cited as a reason for continuing the use of lead ammunition. In Montgomery County, Maryland, for instance, the police have switched to non-lead ammunition at the indoor firing range, but the local high schools have not. In a 2013 report, Sean Yarup, Environmental Team Leader of the Indoor Air Quality Office, Division of Maintenance of the Montgomery County Public Schools denies the possibility of elevated blood lead levels in firing range participants. The Montgomery County, Maryland report cites the study performed by HET. The Montgomery report does cite a 2012 study by the National Research Council that found "overwhelming evidence" that 30-year-old federal standards governing lead exposure at Defense Department firing ranges and other sites aren't strict enough to protect workers from ailments associated with high blood lead levels. "In the summary section of the report, the National Research Council specifically states that the OSHA standard provides inadequate protection for DOD firing range personnel and for any other worker populations covered by the general industry standard. In other words, the study addresses occupational (worker) exposure as opposed to non-occupational exposure." After stating the air is safe to breathe, the CMP's guide states that high school children who fire lead pellet rifles in classrooms and gyms are safe from lead contamination if they wash their hands, keep open food and drink away from shooting activity, and refrain from chewing on the lead pellets. Even though all available medical evidence indicates that handling lead pellets during air gun firing does not create elevated lead levels, lead is still a toxic substance and ingesting lead into the body has a potential risk to one’s health. For this reason it is important that all air gun shooters take certain precautions while handling lead pellets. 1) Anyone who handles air gun pellets during shooting must wash hands their hands, with soap and water, after they finish shooting. 2) No food or open beverage containers may be taken into the range and no food may be consumed on air gun ranges. It also should go without saying that pellets should never be placed in a shooter’s mouth." The view in this 2013 document is based on 25 year-old research which has been discredited. According to the National Institute for Occupational Safety and Health http://www.cdc.gov/niosh/topics/ranges/ washing hands with soap and water is not completely effective in removing lead from the surface of the skin. NIOSH researchers developed and patented a novel and highly effective skin decontamination/cleansing technology. NIOSH recommends use of this technology to reduce the risks of lead exposures after firing weapons. As stated, lead fragments are deposited on the gym or classroom floor in front of the gun muzzles and on the floor in the area around the backstops. The CMP recommends school personnel dispose of these fragments according to strict guidelines. "Lead residues on range floors can be very effectively cleaned and removed. If shooters do not move past the firing line to go downrange except as authorized, and if personnel who go downrange follow the Guidelines for Air- gun Range Design, Cleaning and Maintenance, there is no immediate health hazard to shooters or other person who remain behind the firing line." Last year, researchers commissioned by the Pentagon said that decades-old limits on lead exposure are inadequate to protect the health of workers on military firing ranges. Additionally, the National Academy of Science has reported that lead from ammunition fired on Army, Navy and Air Force ranges in the last five years has "frequently exceeded" those limits, "in some cases by several orders of magnitude." Sen. Ben Cardin expressed concern about the report's implications for workers at Maryland military installations with firing ranges. They're at risk," the Maryland Democrat said. "This report shows that exposure to lead from firing ranges is a health hazard, and we can do a better job of protecting the public health." Cardin, however, has not responded to concerns that several dozen firing ranges located within the state's high schools that are run by the military as part of the JROTC program, may also threaten public health. Here's a list of the necessary procedures in the CMP Guide designed to protect the health of children in high schools with shooting ranges. Can you imagine your local high school meticulously following these procedures? • Pellet traps designed to effectively contain the pellets and pellet fragments must be used. • Only authorized adult personnel who follow proper procedures should remove lead from pellet traps or target holders. • With this type of pellet trap, you must still ensure all residues fall behind the target line by carefully inspecting the areas behind and in front of the target line before establishing the range map. • Lead consisting of spent pellets or pellet fragments that is re- moved from the pellet traps is regarded as a recyclable material. After a quantity of this lead is accumulated, take it to a recycling center. • If you are working with an older range that does not have a smooth floor, consider replacing or covering the floor to achieve a smooth surface that is easier to clean. • On ranges where the target system allows lead pellet residues to deposit on the floor forward of the targets, it is recommended that the range staff establish a lane (paint or tape a line) to provide a designated walking path for the coach or authorized athlete to follow while moving to the target line. • At the target line, it is recommended that the designated target changer put on disposable shoe covers before walking over any residues that may be in front of the targets. • If the air gun range is in a multi-use facility where other activities will take place in the downrange area after air gun firing concludes, that area must be cleaned after every training or competition session. • After firing activities have ended, have the athletes remove shooting equipment from the firing line, ensuring that they do not step over the firing line. Using a shop vacuum, start from behind the firing line and move parallel to the firing line, carefully vacuuming from the firing line downrange for ten feet. Start again from ten feet in front of the target line and move parallel to the target line, vacuuming to the tar- get line (or beyond if there is lead pellet residue behind the target line. • Ensure that the shop vacuum’s cord, wheels and hoses do NOT drag through un-vacuumed area. Always keep the vacuum and the vacuum operator in the clean area of the range. The operator should not step on or stand in a potentially contaminated area. • Range floors that are roughly textured or porous may require mopping with tri-sodium phosphate, a buffering solution that suspends particulates long enough to be picked up by the mop.